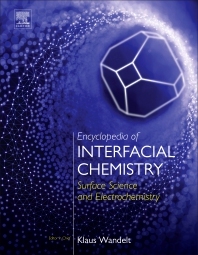 Encyclopedia of Interfacial Chemistry: Surface Science and Electrochemistry summarizes current, fundamental knowledge of interfacial chemistry, bringing readers the latest developments in the field. As the chemical and physical properties and processes at solid and liquid interfaces are the scientific basis of so many technologies which enhance our lives and create new opportunities, its important to highlight how these technologies enable the design and optimization of functional materials for heterogeneous and electro-catalysts in food production, pollution control, energy conversion and storage, medical applications requiring biocompatibility, drug delivery, and more. This book provides an interdisciplinary view that lies at the intersection of these fields. Klaus Wandelt received his PhD in Physical Chemistry at the Ludwig-Maximilians-University (LMU) in München in 1975, he spent a postdoctoral period at the IBM Research Laboratory in San Jose, California, between 1976 and 1977, and qualified as a professor by his Habilitation at the LMU, München, in 1981. After his first appointment as professor in physics at the LMU in 1983, he moved to the Fritz-Haber-Institute of the Max-Planck-Society (FHI) in Berlin in 1986 and also became professor of Physical Chemistry at the Free University (FU) in Berlin. In 1988 he accepted a position at the University of Bonn, where he was professor and director of the Institute of Physical and Theoretical Chemistry until 2010. After his retirement at the University of Bonn, he became guest professor in Experimental Physics at the University of Wroclaw, Poland, as well as at the University of Rome, Tor Vergata, Italy, and continued research and teaching in interfacial physical chemistry. Using a broad arsenal of surface methods, including scanning probe techniques and synchrotron radiation, his research focuses on fundamental aspects of the physical properties and chemical processes at metallic surfaces under ultrahigh vacuum conditions and in aqueous electrolytes, on the atomic structure of amorphous materials, and, most recently, on processes at the surfaces of plant leaves. Klaus Wandelt supervised nearly 200 Master-/Diploma- and PhD-theses, published nearly 500 papers, edited 20 books and special issues, and co-authored more than 1200 presentations at conferences, workshops and colloquia. He was visiting researcher and lectured courses in surface physics in Caracas (Venezuela), San Jose (California), Hefei (China), Newcastle (Australia), Messina, Palermo, Padua, Rome (Italy), Vienna, Linz (Austria), and Wroclaw (Poland), and he served as Editor of the journal Surface Science, and Surface Science Reports. He was chairman of the Surface Physics as well as Condensed Matter Physics Division of the German Physical Society (DPG), the Surface and Interface Section of the European Physical Society (EPS), as well as the Surface Science Division of the International Union of Vacuum, Science and Techniques (IUVSTA), and he was member of the Executive Committees of DPG and EPS. He was also co-organizer of more than 30 national and international conferences and workshops on surface science, and member of numerous national and international evaluation panels. Among others he was awarded the Doctor honoris causa (Dr.h.c.) degree by the University of Leipzig, Germany.